Economics research and forecasting group Infometrics is picking that house prices will soar next year, with house price inflation peaking at 14% in 2015/16. The forecast, not the first such bold house price prediction from Infometrics, is contained in the latest market research report from real estate and property management firm Crockers. In the Crystal Ball 2014 issue, which as the first market research report of the new financial year is the one issue in the year that contains predictions, Infometrics - "partnering" with Crockers for the issue - says healthy economic and income growth throughout this year and next will "underpin" strong demand for housing next year and lead to another round of house price inflation. However, first, Infometrics reckons we face a big slowdown this year, with the flow-on effects of the Reserve Bank's 'speed limits' on high loan-to-value lending leading to house price inflation by the end of this year of just 2.4%, with the biggest slowdown likely in Auckland "where affordability issues suggest that the LVR restrictions should have the greatest effect". Recent statistics have suggested that the LVRs are indeed helping to slow the market, and the latest QV figures showed the rate in annual house price growth to March had dipped to 8.8% from a peak of 10% in December. But Infometrics sees the impact from the LVR restrictions as very much temporary and says from next year supply shortage issues should "ensure" that house prices in Auckland and Canterbury "continue to rise relatively rapidly". 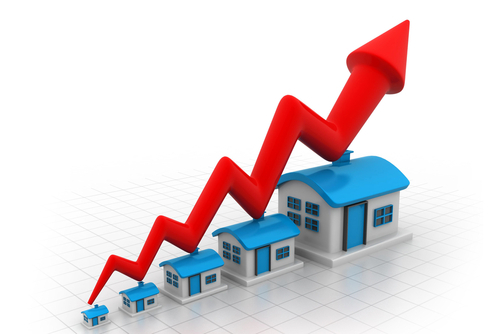 House sales are likely to rise from current levels of around 80,000 in a year to about 100,000 by the end of next year. "...The strength of export incomes and their stimulatory effect on provincial economies is likely to drive up property prices around the country as well. "Infometrics expects nationwide house price inflation to peak at 14% in 2015/16, with higher interest rates eventually sufficient to restrict both the housing market and more general economic activity," Infometrics says. And Infometrics goes further: "Some reversal in prices is possible in 2017 and 2018 as economic growth slows and the undersupply of housing in Auckland and Canterbury is resolved." On the rentals market, Infometrics says that gross rental yields in the past few months have dropped toward the record lows seen between mid-2007 and early 2008. However, "anecdotal reports" suggested that property investors were getting more active in the market again following the introduction of the LVRs in October. "With fewer first home buyers in the market to bid up prices, investors have a greater chance of of obtaining property at the lower end of the market at a reasonable and economically viable price. "Infometrics expects rental inflation to gain momentum this year and run ahead of house price inflation. "Strong population growth and a rapidly expanding economy will boost the rate of household formation and increase demand for rental accommodation. "These demand conditions will enable landlords to put up rents at the same time as price growth is slowing due to the LVR restrictions," Infometrics says. Among other picks, Infometrics is going for 150 basis points of interest rate rises from the Reserve Bank this year - which would see the Official Cash Rate at 4% by year end. Infometrics also reckons that the currently surging net migration figures will peak at around 30,000 by mid-2014 and then dip to 18,600 by March next year as the Australian labour market begins to stabilise (poor job prospects across the Tasman have led to many kiwis staying at home) and the Canterbury rebuild winds down. Predictions for provincial areas? (Yes, still 1 or 2 citizens living outside of Auckland & Chch). take your blinkers off jaffa! The provences might note be fighting each other for a bigger ball and chain but they are according to recent stats the more productive. The latest monthly property value index shows that nationwide residential values for March have increased 8.8% over the past year, and 0.1% over the past three months. This means they are now 12.6% above the previous market peak of late 2007. When adjusted for inflation the nationwide annual increase drops slightly to 7.0% and values remain below the 2007 peak by 2.8%. When adjusted for inflation ...... values remain below the 2007 peak by 2.8%. I can find QV information for November 2013 - 2.5% increase over 3 months. And January 2014 - 1.5% over 3 months. And today, for March 2014 - The latest monthly property value index shows that nationwide residential values for March have increased .... 0.1% over the past three months. Can anyone spot the trend? They are smoking whatever the real estate agent's ecquivalent of crack is. It's up there with NZ Herald's recent story - "Property values up 8.8%" which a classic spin on bad numbers. When did infometrics last make an accurate prediction eh! I suspect they are pretty good at forecasting what they are rewarded to 'predict'. Actually - to the smug posters above (which is unfortunate because you are both seriously wrong) Infometrics in their last house price forecast (that I have) was dated March 2012. In that they forecast nominal house prices would rise 8.8% in 2013 (march YE) and 6.2% in 2014. So they were quite accurate, if only a tad conservative. Interest.co.nz also linked to a 2011 forecast where they forecast AUckland house prices would rise by 16% in 3 years - their only sin was not being bullish enough. The perma bears on these message boards are as absurd as perma bulls, and equally as thoughtless. I do acknowledge that their latest forecast comes co-branded with Crockers, which seriously limits the objectivity of the report, and makes Infometrics come across as venal. I also think there is a risk they have drifted into perma bull territory and I struggle to get my head around their forecasts - but history is history and facts are the facts - and they have been more right than almost anyone. I know Infometrics are only predicting yearly increases of 7% here but I have to say, it's a great time to be invested in property. All's still well in Landlord land. Posted in Property August 11, 2011 - 07:45pm"
They underestimated the extent of price rises from 2011 to 2014. Gareth Morgan and infometrics are generally pretty accurate, and if anything tend towards being slightly bearish on nz property.